Whatever your opinion on the authorship of the Rhesus—Euripides? His son? Agathon?—it is an unambiguously odd play. No prologue, a Hector who seems more interested in sleeping than fighting the Trojans, a Paris who thinks his judgment of Aphrodite was the best thing that ever happened to Troy. It’s a play that would have driven Aristotle mad, full of characters who begin to act like tragic heroes and then never reappear. The ending (such as it is) invents a mother for Rhesus in the person of an unidentified Muse who steers the play hard right into mystery cult. It’s one of those plays you never really expect to see a production of. And when you do, you must drop everything to go see it. 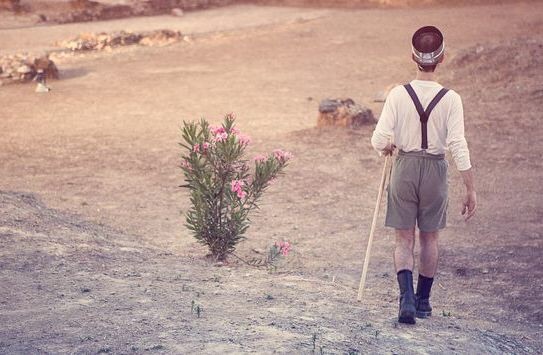 Katerina Evangelatos’ production of the Rhesus, part of the 2015 Athens Festival and running through August 9, takes place on the archaeological site of Aristotle’s Lyceum. It’s an appropriate choice for a play billed as by “Ευρίπιδη [;]” given that the identification is conjectural. The site only opened to the public a few years ago, and consists of low foundation walls, part of a bath complex, and a well-tended park surrounding it. Evangelatos connected her production to the site right away with a “peripatetic” portion of the performance. The audience was divided into four groups, each of which was led to a different side of the site as the chorus entered, marching like sleepwalking versions of the guards outside of parliament at Athens. As the audience was shepherded between vantage points, the chorus fell into and out of small groupings, jumping over walls, wrestling in the dust, scattering paper flowers, all while passages from the Physics and On the Interpretation of Dreams were read over the loudspeaker. The experience was rather baffling—my modern Greek skills are barely up to the challenge of asking for directions, much less following Aristotle—but the choreography was impressive, and the Dreams especially is a good choice given the play’s recurring themes of sleep. I don’t think that the peripatetic aspect added anything from an audience perspective; the guides in charge of shepherding the audience were in need of practice, and the movement was distracting. When the Euripides (?) portion of the performance began, it was very clear where Evangelatouswould stand on the question of whether the Rhesus took the place of the satyr play: she thoroughly embraced the humorous and nonsensical aspects of the play. The Trojan camp became a bizarre and charming combination of Neverland, Calvinball, and the Hardy Boys. Hector was kitted out in an oversized Napoleon hat and an extra-long telescope, while his soldiers were armed with buckets, mops, and wooden swords over costumes evoking a 1940’s summer camp for boys. The choreography (Patricia Apergi) was the star of the production. The ensemble leapt, danced, fought, and climbed with a ferocious energy and athleticism, their movements reinforcing the humorous and innocent delivery of the text with pure physical comedy. The chorus provided the characters as well, individual chorus members donning or doffing costumes as necessary. Standout moments included Dolon’s scene, in which Dolon races all the way to the other end of the site in his eagerness to spy on the Greeks before Hector manages to call him back. I particularly enjoyed the fact that the actor playing Hector doubled as Athena—an good reminder that the original performance would have been a man acting as Athena acting as Aphrodite. Athena’s interactions with Paris, a Linus-like character dressed in a sailor suit and toting a butterfly net, were handled beautifully as a point of tension between the childlike/dreamlike performance and the very much adult and serious themes of war, death, and love. In all, Evangelatos’ Rhesus was a refreshing and wonderful experience. By reframing the play as Hector’s dream, she embraced the absurd elements of the text and made the disjointed plot an asset rather than a problem.